The southern North Sea Basin area permits a detailed sequence-stratigraphic approach and differentiation between regional and eustatic changes (e.g. in comparison to the New Jersey eustatic record). 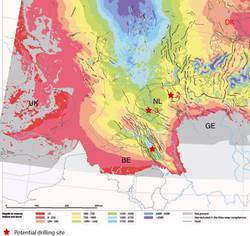 Although the basin is considered mature in terms of commercial drilling, the Cenozoic is generally not targeted, and therefore a robust integrated chronostratigraphical framework is lacking. The area offers a unique opportunity to obtain a near-complete record of the Cenozoic era.